A snowy owl at Hampton Beach, after the crowds have left. Today we’re heading to one of the most ubiquitous ecological landscapes in the world. The Coastal Sand Dune is found in nearly all latitudes from just outside the polar regions to the equator. But there are only a few places in the granite state that you’ll find them, and as you might expect they’re all on the seacoast. Chris and Dave take us on a walk around the block of another of NH's Wild Neighborhoods. And there is a particular set of circumstances that are required for Sand Dunes to form. Sand and silt made from eroded rocks further inland washes down mountain streams that feed into ever larger waterways until they reach the mighty Piscataqua and Merrimack rivers. Where the rivers meet the ocean, the water suddenly slows, allowing that silt and sand to precipitate out to the sea bed. From there tides and winds wash and blow all those individual grains of sand ashore. Gradually those grains accumulate around debris on the shore, like some drift wood, or a plant, and over time they form sand dunes. The foredune is characterized by the beach grass that populates it. Credit Photo by Ken Kimball. Because of the wind and waves, sand dunes are constantly shifting in shape and size. And vegetation that survives on these dunes has adapted to constant change. Many of them rely on rhizomes. This underground element of the plant is a bit like a root in that it is below the surface, but rhizomes are actually more a part of the stem of the plant. And in the case of some of our dune vegetation, like beach grass, rhizomes grow horizontally sending sprouts of grass up through the sand to capture sunlight; and sending roots down to collect water and nutrients. Rhizomes also allow plants to move water and nutrients from one part of the plant to another that may need more of those resources. 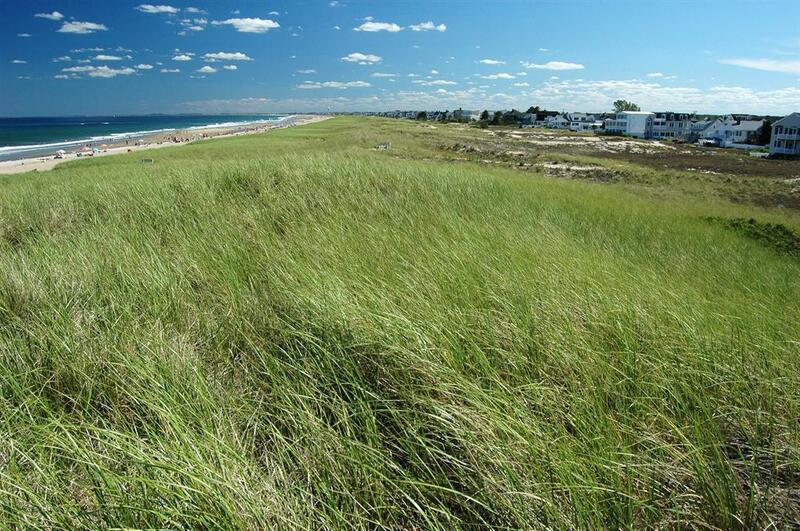 Not every plant you find by the beach uses that strategy, but many do and beach grass survives on the foredune, where few other species do, largely because of this strategy. Fordune is one of the three elements of your typical sand dune, and is the part closest to the ocean. It is most exposed to tides and often punishing winds, and as a result not many species set up shop there. But when you move into the interdune, and the backdune – into positions better protected from the incessant tides and the dehydrating effects of the wind – you find more diversity of species. You’ll find hairy hudsonia in the interdune, a low growing shrub with yellow flowers that also takes advantage of that rhizome strategy. And the backdune is home to woody vegetation like beach plum with those nice pink flowers. Credit Courtesy J. Maughn via Flickr/Creative Commons. The animals that call this place home are mostly fair-weather feathered friends. Species like the least sandpiper use the dunes as a stopover during migration, feeding on ant-beetles and other insects in the dunes. 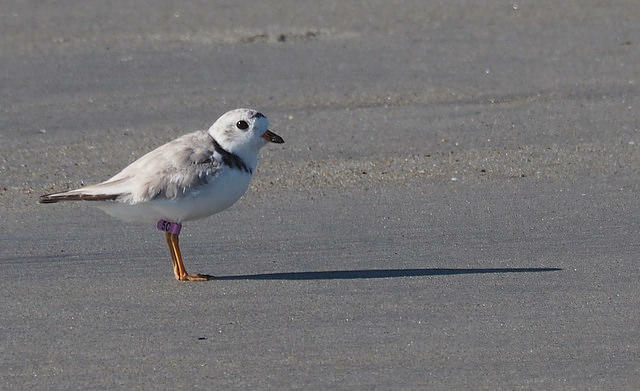 But you’ll also see the tiny and federally threatened piping plover which lays its eggs in the foredune – the most exposed part of the dunes! Though the plovers don’t stick around in the winter, there are some that you’ll only find there in the winter. Like the snowy owl. They spend their summers breeding in the artic, but when winter pushes some of them south they seek out habitat that most closely resembles the frozen tundra, feeding on mice and voles. You can also find small flocks of horned larks and snow bunting feeding on whatever seeds they can find until they can return to their arctic breeding grounds. Coastal sand dune is a vibrant wild neighborhood, and if that weren’t enough it’s also a part the first line of defense against increasingly severe storm surges. Coastal dunes and wetlands absorb the brunt, when storms make landfall, reducing the impact on neighborhoods, both wild and developed, further inland. These remarkable dunes are more than just a bunch of sand. Help us celebrate 20 years of Something Wild! Share your favorite SW memory below or call 202-649-0835 and leave a message for Chris and Dave...or Rosemary and Iain. This summer, beach-friendly wheelchairs will be available for free at several New Hampshire beaches.